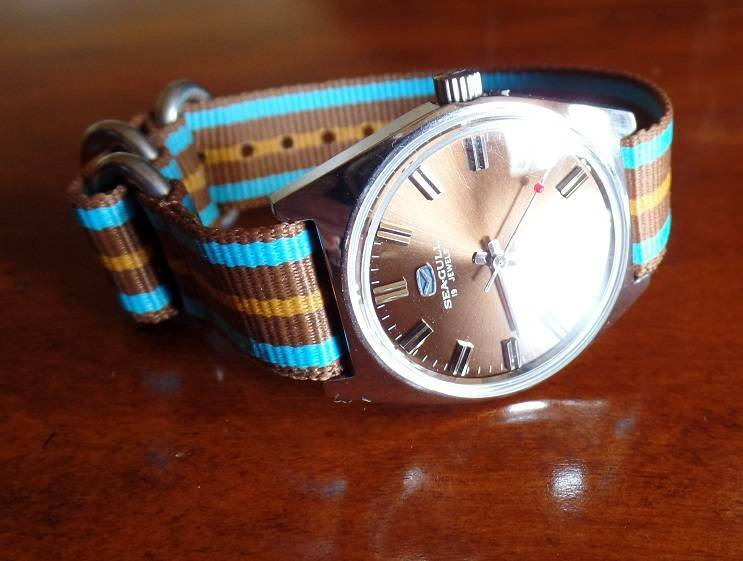 Hello, all, and welcome to yet another edition of "Mort's New-to-Me Follies," this one showing off my NOS Seagull with the 'root beer' brown-colored dial. 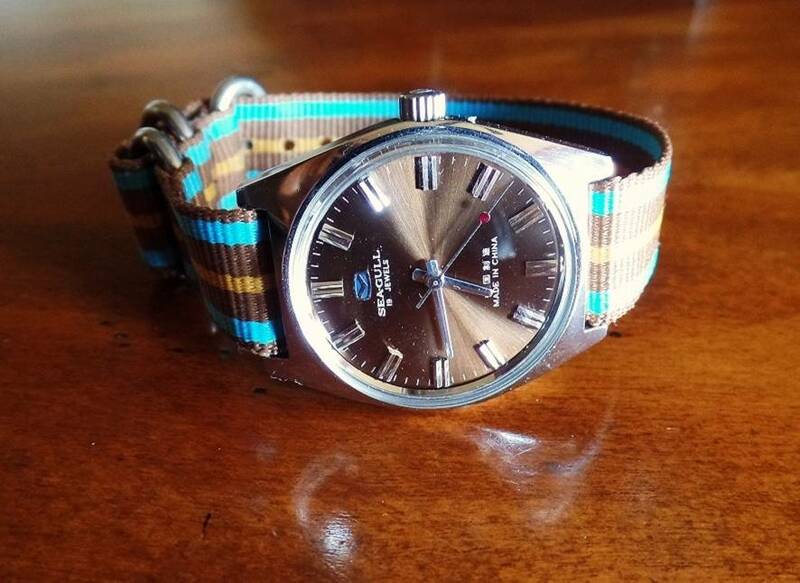 I already had the black NOS version, which looks pretty doggoned cool with a nice black leather strap, but when I caught a gander at the very unique shade of brown on this particular Seagull, there was no doubt in my military mind that I had to have it. 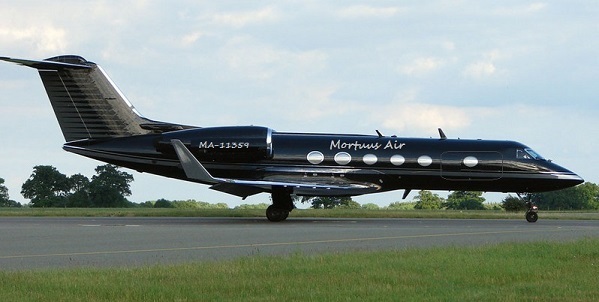 And, given its $55 USD price tag, I figured that even Mrs. Mort wouldn't have any problem with such a nice purchase...of course, like about 99% of married men, I made a miscalculation with that particular bit of thought processing, but what the hey; some things just remain in stasis, like the reassuring presence of Jupiter and Mars in the night sky. Despite its diminutive case size (34.5mm wide X 42mm lug to lug), it looks pretty damned fine when you open up its little glassine envelope and see it for the first time; and odds are pretty much 50/50 that you'll see something like the above photo or the one below just before you retrieve it from its little cocoon. There's just something special about the way Seagull puts these together. They waste no opportunity to add any pleasing-to-the-eye detail that they can. 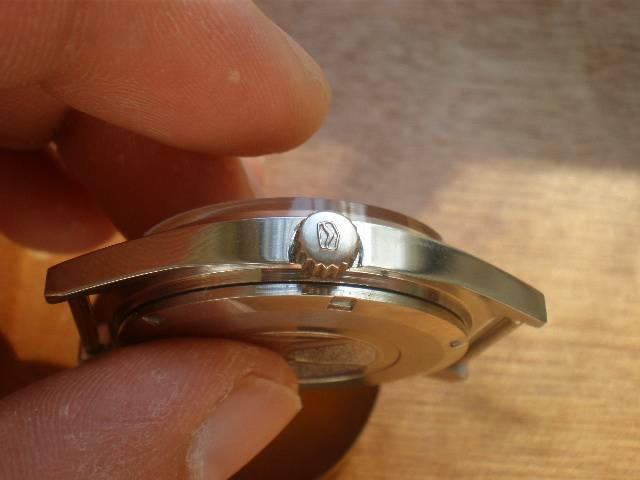 Everything about the case, from the amazing 'root beer' brown dial -- with the blood red little dot on the seconds hand and the blue-filled Seagull logo -- to the sides and back is superbly detailed and very, very easy on the eyes. Of course, any WIS worth his salt is going to want to see the 'innards,' so I have conveniently added the above and below pictures for your perusal. 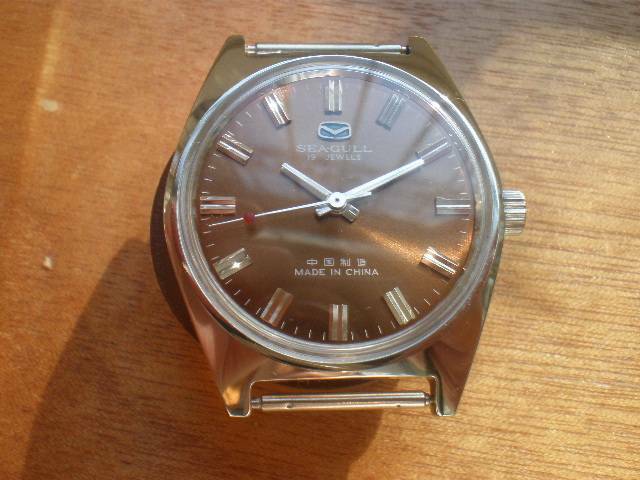 As I mentioned in my previous Seagull photo essay, the ST5 mechanical movement is truly iconic to those who enjoy Chinese Horology, and it has even earned its chops among those who are skeptical of anything watch-related that comes from the PRC. 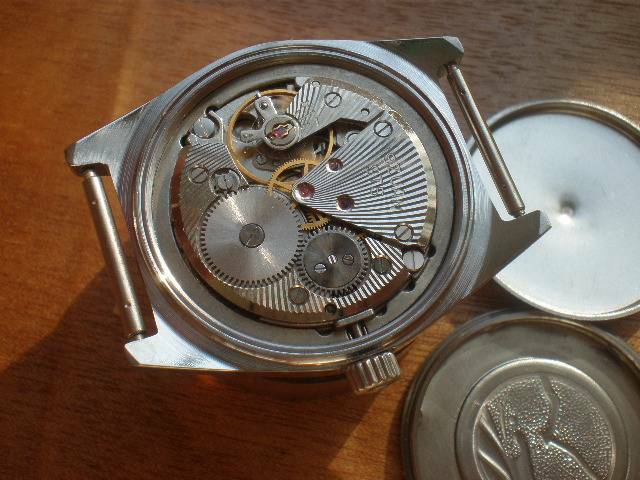 They even threw in a nice anti-magnetic inner movement cover to keep the movement from getting, well, magnetized. The brown was, of course, a near-perfect match, but the two 'turquoisy' (hmmm, spell-check says I just created a new word...how's about that, eh...?) 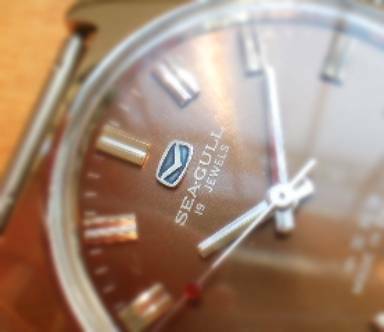 blue stripes really caught my eye, even matching, to a certain extent, the pale blue 'fill' coloring in the Seagull logo below the dial's 12 o'clock position. 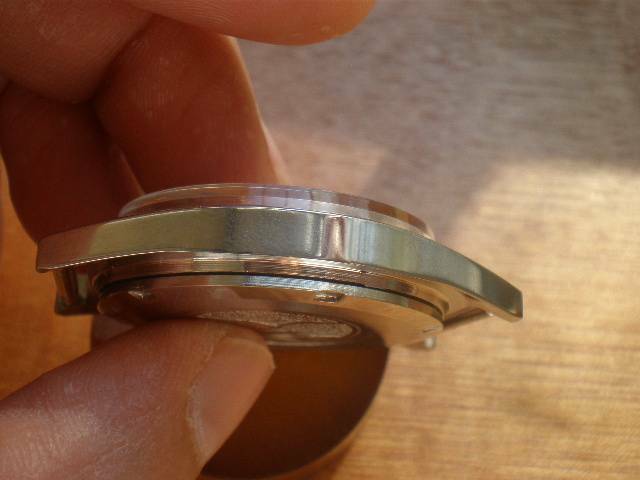 And, as a finishing touch, there's a thinner -- but still cool-looking -- orange stripe down the center that, while it doesn't match much of anything on the watch, still adds a very nice visual-balancing touch. As the late/great John Lennon used to say, "I like that." 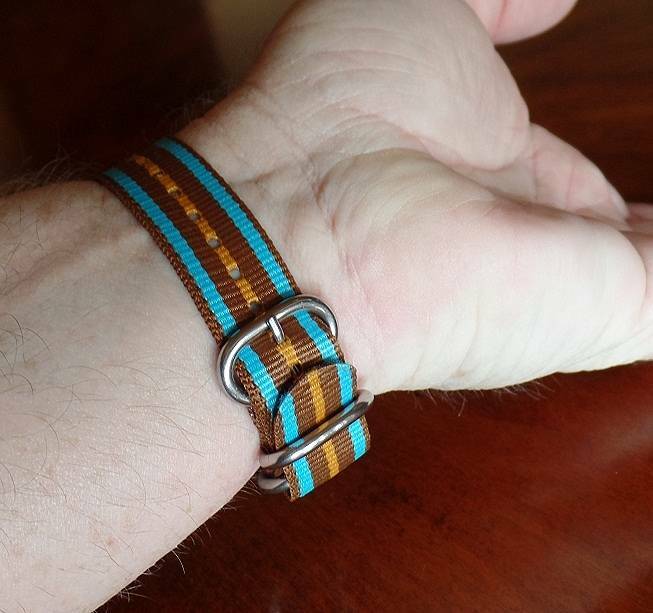 And, of course, like most NATO straps, it's very comfortable and very light on the wrist...which is sort of a redundant statement, I suppose, but what-the-hey; whose essay is it, anyway, right? 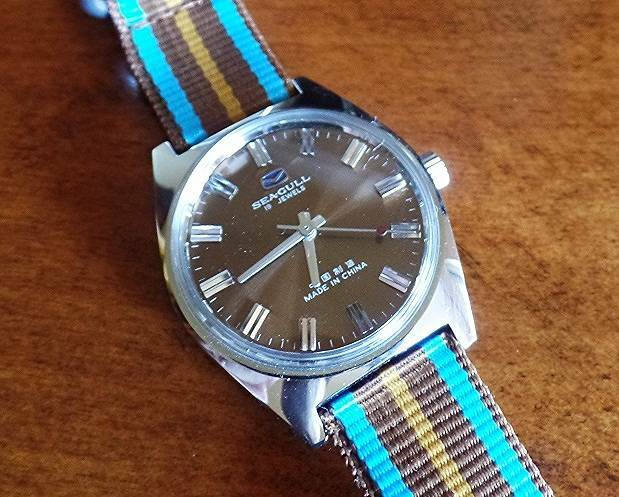 So there you have it, fellow Watch Forumiters; the 'root beer' brown-colored dial-wearing, ST5 movement-sporting, New-Old-Stock Seagull Men's Mechanical Watch, complete with colorful NATO/OTAN strap. Hmmm...I dunno. How does a 'loose maybe' sound? Dang...there's those crickets again. 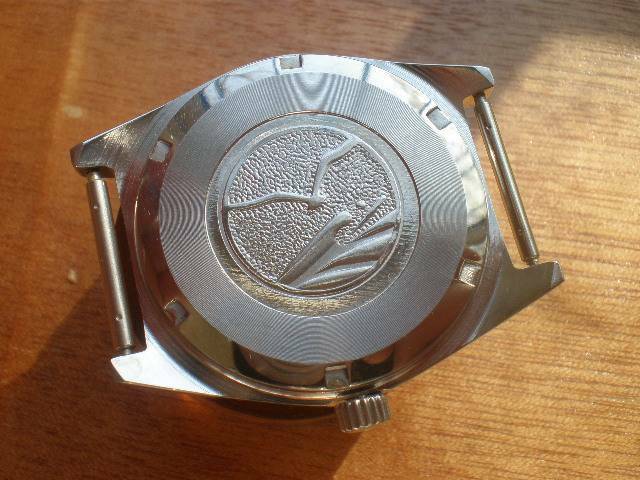 Everything from a Rolex to a $55.00 Seagull! 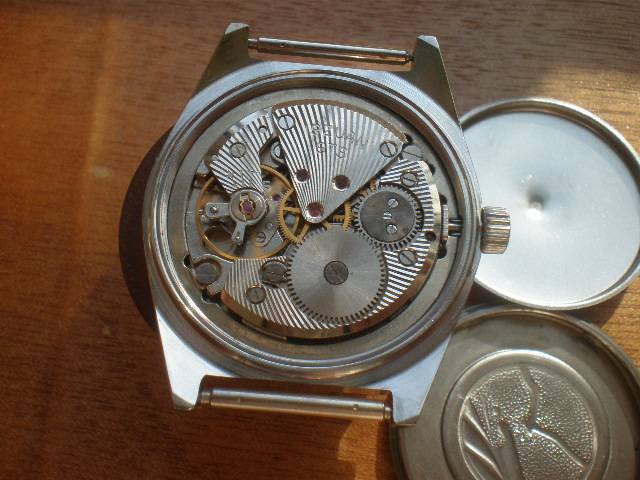 gregl515 wrote: Everything from a Rolex to a $55.00 Seagull! 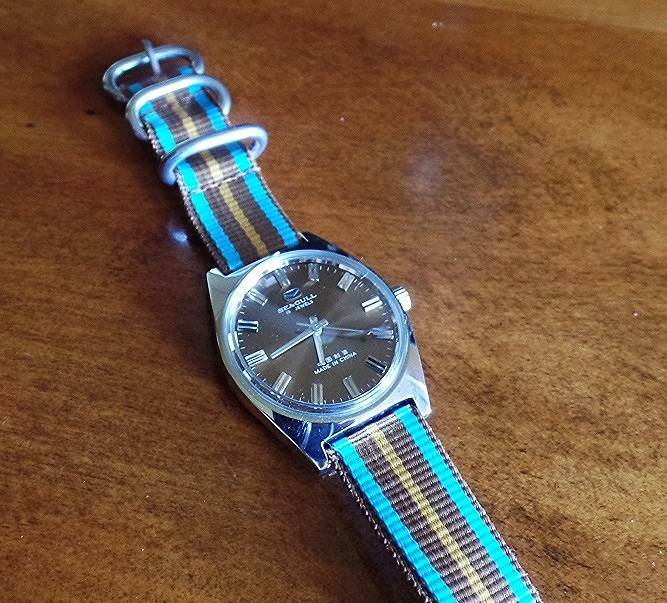 Fun little watch. For $55, it packs a little punch. 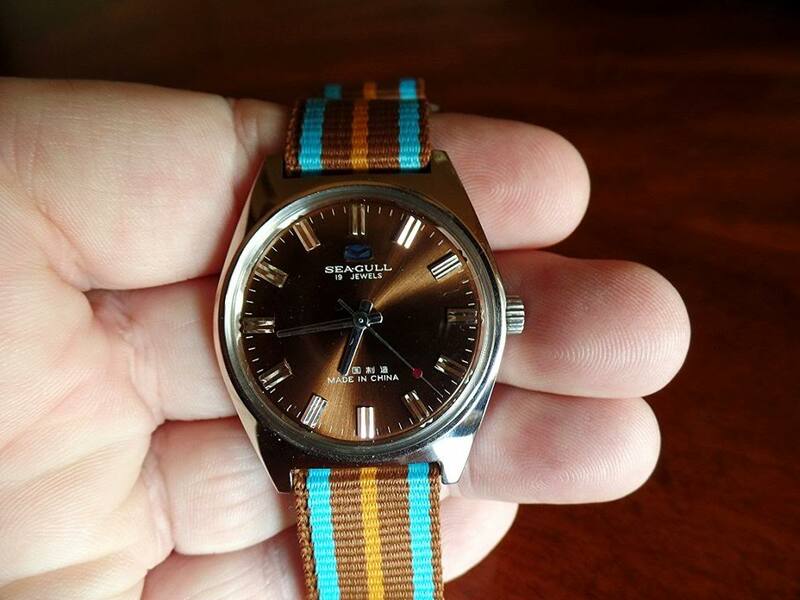 That " root beer" color is versatile and looks great with that NATO. 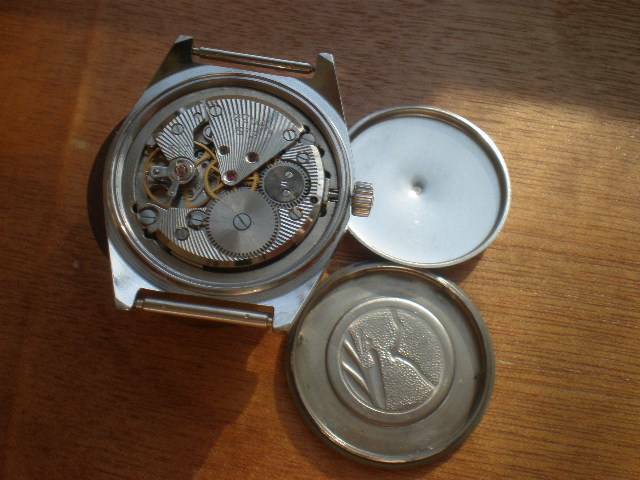 wottime wrote: Fun little watch. For $55, it packs a little punch. 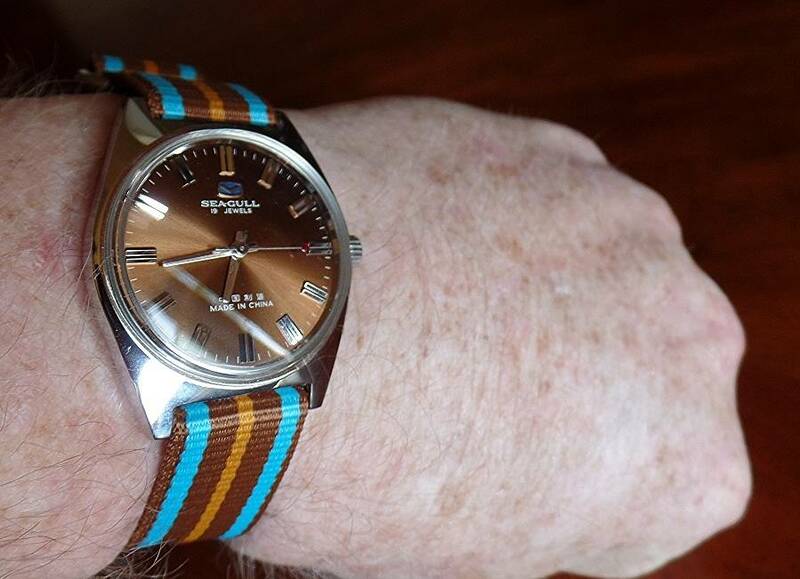 That " root beer" color is versatile and looks great with that NATO. Thank you, wotts! This one really is a win-win, and I really enjoy wearing it.